The espresso machine arrived and I spent a few hours yesterday and today figuring it all out. I think I’ve just got to the point that I can operate the grinder properly! It’s not as easy as it sounds. 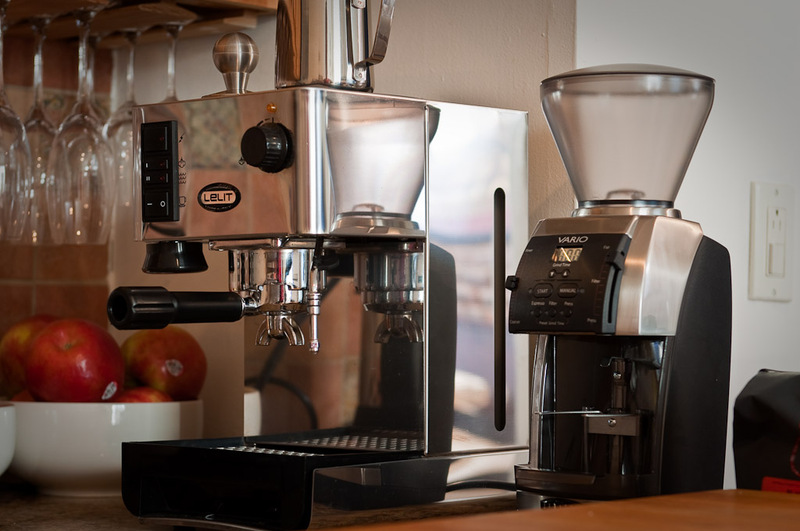 The coffee, the machine and even how hard you tamp the coffee are all factors in determining the correct grind setting. Too fine and the machine gets clogged. Too coarse, and you get a 4 ounce watery, bitter mess. Not to mention there are a few hundred possible grind settings on this thing! The whole first day, I thought the grind was too fine because water was leaking from the top of the coffee filter. It turns out I just wasn’t torquing the coffee filter enough to seal it against all that pressure. I was making it coarser and coarser when it was already too coarse. Today I think I got the right idea. A perfect 2 ounces came out in 25 seconds. Still bitter and watery, but I was just trying to figure the grind on some older stale coffee beans. I’m in the general area and when I change beans, I’ll probably have to fine tune it again. Tomorrow’s goal is to get the temperature/timing right and work with some nice, fresh beans. I have a couple of pounds that were just roasted on Tuesday! My main goal with this relatively inexpensive machine is to find out which features really matter to me. I was reading quite a bit and there were many features that sounded great, but I didn’t want to end up with a $2000 machine and find out I really don’t care about half of them. This machine is to get some real world experience to find out what I do care about. For example, one feature that I didn’t even think about before was the boiler capacity. I thought that I just wanted enough for a shot or 2 of espresso every now and then. In real life, to get the temperature just right, you are dumping a lot of water out of the boiler. The problem I was having before I gave up for the night was that by the time I got the temperature just right, the boiler went empty and needed to refill from the room-temperature water reservoir, which screws with the boiler temperature again! You silly analog world! Anyway, it’s all pretty complicated, which I LOVE! Not to mention I am just getting started. Once I figure out the temperature thing, there are still all sorts of other things to learn about.